This is a very fun action and adventure game in which you will have to try and save your best friend which was kidnapped by the malicious dragon. The horse you had was very close to you and you knew him well. Such a friend is hard to find and only come one in a life time so you have to do everything in your power to bring him back and ride together again. There will be a series of dungeons you need to pass in order to reach the dragon boss. Complete the mini puzzles and get the key to unlock the doors so you can advance. Try to smash the skeletons with the environment objects and they will drop the key you need so much. Use your brains before your sword as there can very well be traps along the way. 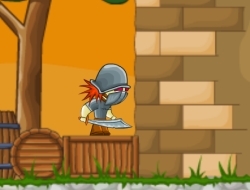 Use the arrow keys to move, X to jump and C to use the sword. Dragon Quest 0.00 between 0 and 10 based on 0 votes.